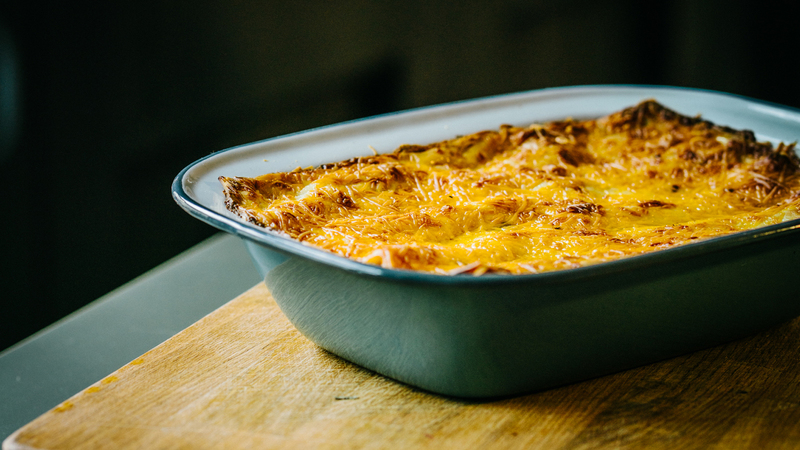 Layers of meaty sauce with cheese and béchamel sauce, topped with more glorious cheese – it is little wonder that lasagne is a real family favourite. The lasagne sheets do not need precooking. The lemon zest will light up the béchamel sauce! 1. Heat a little olive oil in a large frying pan and sauté the carrot, celery, onion and garlic for 3–5 minutes, until cooked but not completely soft. 2. Add the minced beef, mix thoroughly and cook until it is browned. 3. Stir in the tomato puree, red wine, thyme, flat leaf parsley and stock and cook gently, uncovered, for 2 minutes. 4. Add the tomato sauce and herbs and cook for 10–15 minutes, until most of the liquid has reduced. Season with salt and pepper to taste. 5. Meanwhile make your Béchamel Sauce. Melt the butter in a heavy-based saucepan over a low heat. Sprinkle in the flour and stir with a balloon whisk. Cook gently for 2–3 minutes, until the roux is off-white in colour. Take care not to overcook it as this will make the sauce discoloured. 6. Slowly pour the milk on to the roux and increase the heat to medium, whisking constantly until it comes to the boil. Season with salt and white pepper and cook for a further 6–8 minutes to ensure the flour is cooked through. 7. Preheat the oven to 180°C/350°F/gas mark 4. 8. Place a layer of the meat sauce in the bottom of a 25 x 18cm (10 x 8 inch) baking dish. Add a layer of the pasta, a layer of béchamel and sprinkle with some of the grated cheese and lemon zest. Repeat these layers, finishing with béchamel and grated cheese. Bake for 35–40 minutes, until bubbling hot. 9. Serve with a crisp green salad and garlic bread.